The Govs (5-2) won their two most recent matches, defeating a tough Mercer squad, 1-0, before coming from behind to defeat Chattanooga, 2-1, behind a Morgan Drawdy brace. Drawdy and her teammate Mary Parker Powell were named OVC Players of the Week as a result for their contributions the past weekend. Drawdy, who won the Offensive Player of the Week, won her first career weekly award. Powell, who played every minute in goal while recording 11 total saves, won the Goalkeeper of the Week award, her third career Player of the Week honor and second this season. It is critical the Govs get off to a good start in OVC play as only eight teams in the conference make the tournament. The match against Belmont marks the first time in four seasons that the Govs will open conference play at home. 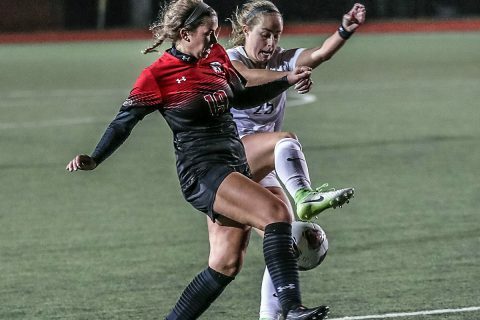 While the Govs only have one win, one loss, and one draw in the last three OVC openers, the Govs have won their opening home OVC match the past five seasons. Austin Peay is also on a 12-match unbeaten streak to OVC opponents at home and on a 19-match unbeaten run at home overall since 2016. Belmont (2-3-1) lost its first three games to open the season, but is unbeaten in its last three matches, which have been all at home. The Bruins struggled with defending in the start of the season, conceding 11 goals in their first two matches, but have only conceded three since. The Bruins have a balanced attack, as seven different players have scored one of their eight goals on the year. The Bruins have played one common opponent this season in non-exhibition matches, losing in a shootout to Middle Tennessee, 5-3. The Govs defeated MTSU, 1-0, in the season opener back in August. The Govs are 6-4-1 all-time against the Bruins, but Belmont has won three of the last four, including a 3-2 win in Nashville last fall. Drawdy had an assist to Claire Larose, while Pamela Penaloza also scored in the loss. Tennessee Tech (4-3) has won its last two outings, but is only 1-3 on the road this season. The Golden Eagles have faced off with one common opponent this season, falling to Evansville, 3-0, a team which the Govs defeated 2-0. The danger woman for the Golden Eagles is Kendall Powell, who leads the team with five goals in seven matches. The Govs have not beaten the Golden Eagles since 2013, with last season’s result being a 2-1 loss on the road. Shelby Stewart scored the lone goal for the Govs that day. Both games will be available to follow along via live stats. Weather providing, both games will also be available to watch on the OVC Digital Network. Sunday’s game will also be senior recognition day, where all Govs seniors will be honored for their contributions over their careers after the match. Admission, like all home APSU soccer matches, is free.